The Irwin Union Bank & Trust Company building and landscape is one of Columbus' Modernist destinations because of the patronage of Joseph Irwin Miller (1909-2004), a Columbus, IN, native, who studied at Yale and Oxford before returning in 1934 where he joined the family business, Cummins, Inc. Miller spent holidays during his Oxford period traveling the continent, which exposed him to contemporary design developments. A patron of the arts, Miller persuaded a reluctant Eliel Saarinen to accept a commission in Columbus in the late 1930s. Eliel’s son Eero, a Yale graduate like Miller, went with his father to Columbus. Miller and the younger Saarinen met and became lifelong friends and collaborators. 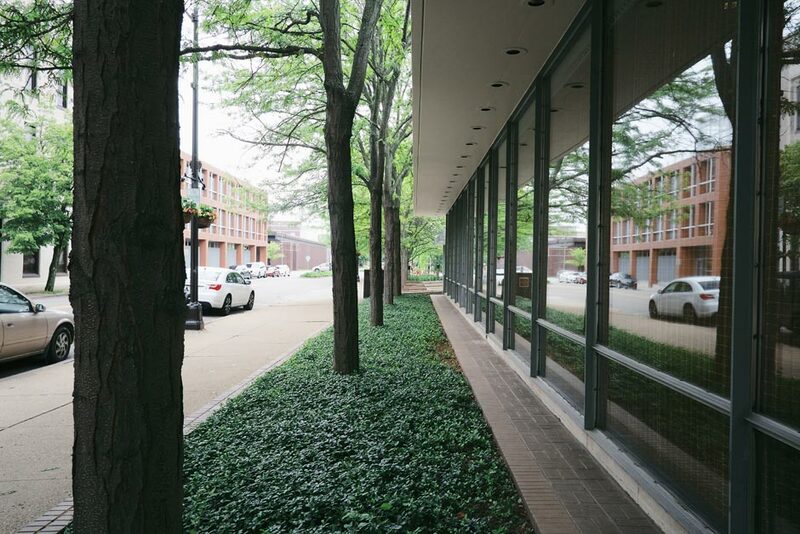 In 1950 Miller commissioned Eero Saarinen to design the Irwin Union Bank & Trust Company building (now known as the Cummins Inc. Irwin Office Building), which was built in 1954. 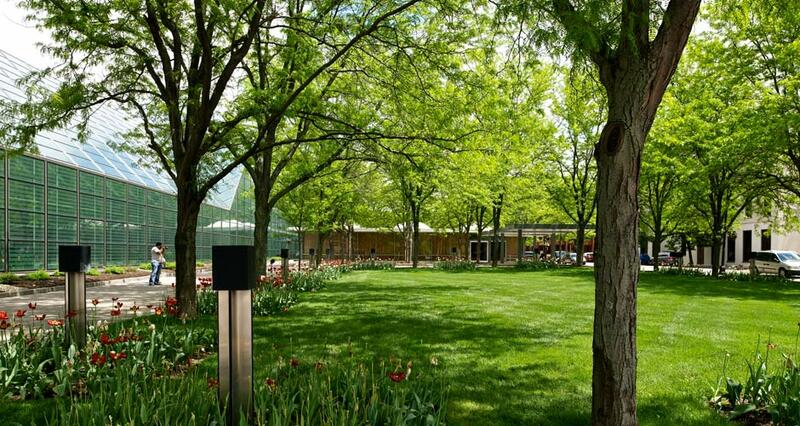 The Office of Dan Kiley was hired to design the original landscape for the one-story glass and steel pavilion. His simple design encircled the building with a single row of lindens planted in raised brick beds. At the time of the bank project Saarinen and Kiley already had a solid working relationship. 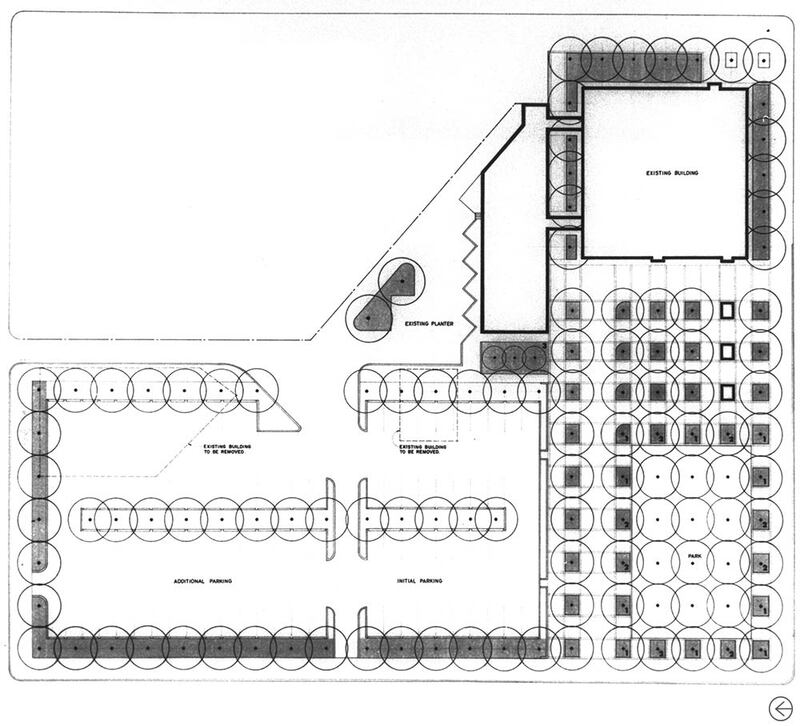 They had successfully won the competition to design the Jefferson National Expansion Memorial in 1947 (they also designed, with Kevin Roche and Alexander Girard, the Miller House and Garden, completed in 1955). Several years after the bank’s completion, the Office of Dan Kiley was contacted to provide plans for an expansion to the property – a drive-thru teller’s window that would reside on the north side of the bank. 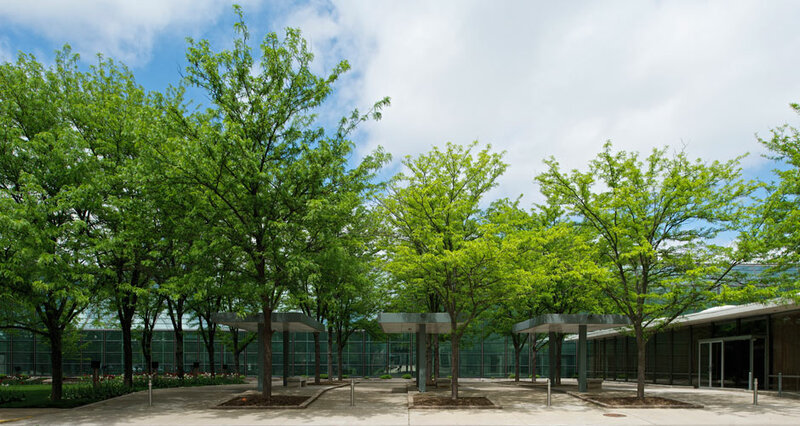 The central feature of Kiley’s design, completed between 1966 and 1968, was the creation of a gridded bosque of three rows of littleleaf lindens positioned twenty feet on center. 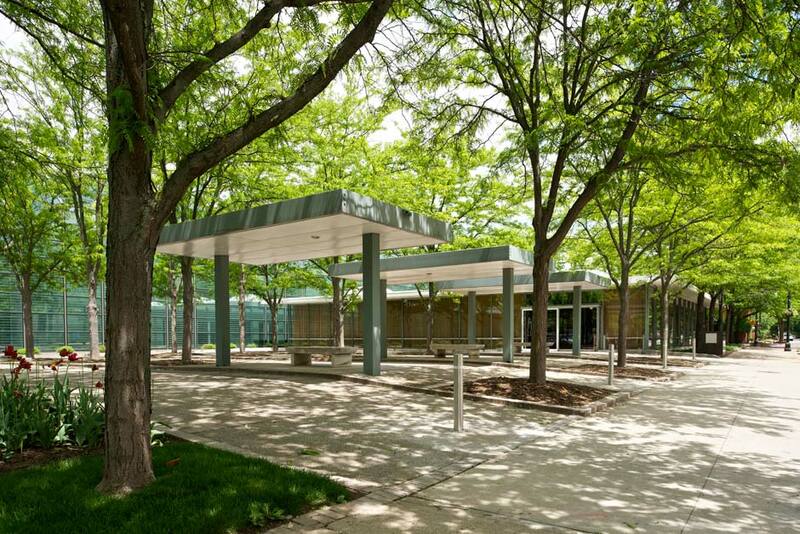 Each row of trees was set in a raised median strip, edged by brick. 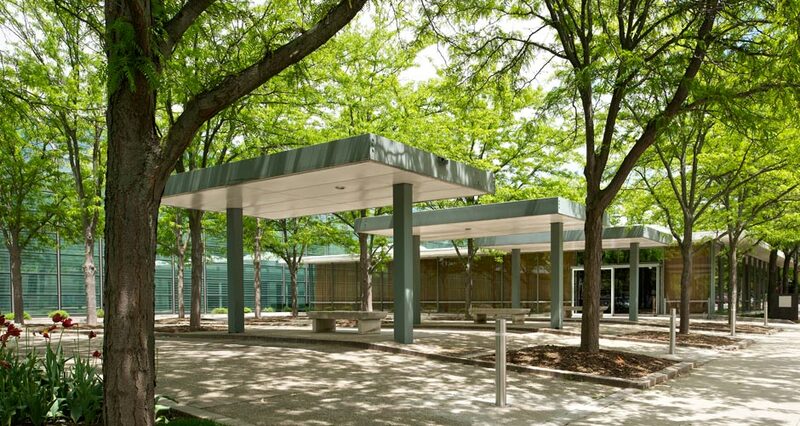 An asphalt drive curves below the tree canopy, a feature that Kiley intentionally designed to provide shade to drivers waiting in line at the bank. The grid is a common feature in Kiley’s designs. 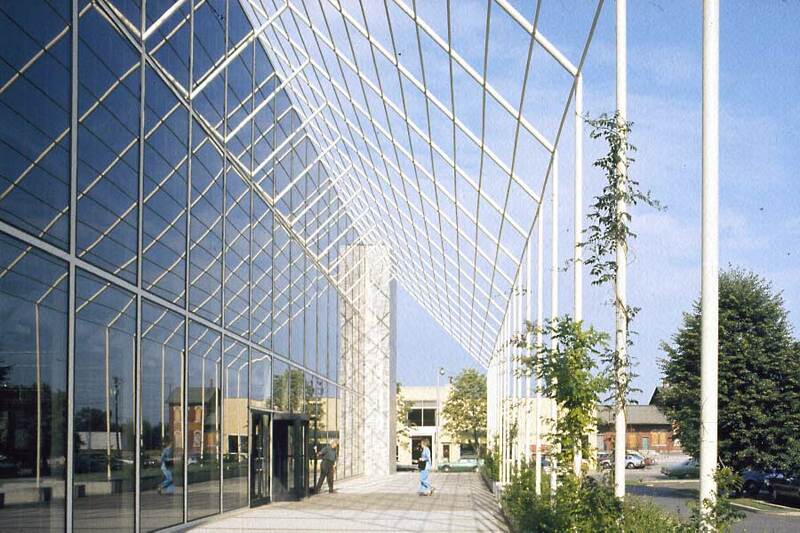 He utilized similar architectural groves in many of his projects at both large and small scales. 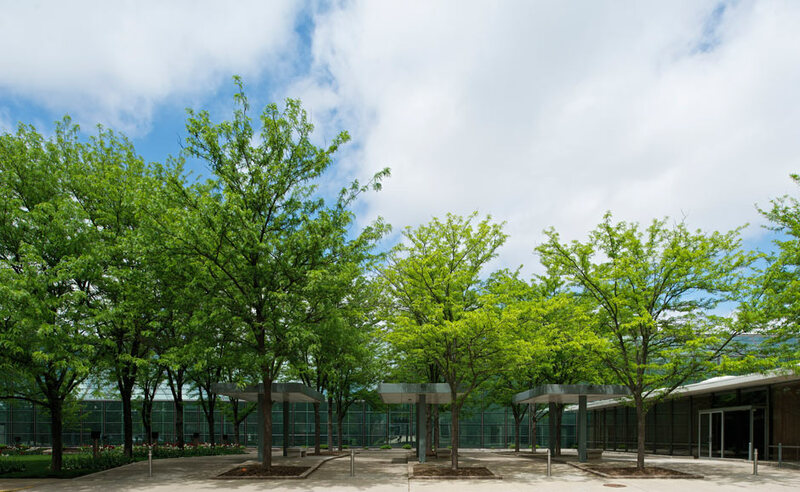 Prior to his design for the bank, Kiley had implemented a grove of crepe myrtles at the Miller House and Garden; later these same groves would be seen at an expanded scale in his designs for the third block of Independence Mall in Philadelphia and Fountain Place in Dallas, TX. To the west of the drive-thru the landscape is less formal. A large open lawn is skirted by square planting beds filled with Japanese yew, groundcover, and seasonal bulbs. Honey locusts have since replaced the drive-thru bosque and additional rows of lindens which extend from the bosque to enclose the lawn. 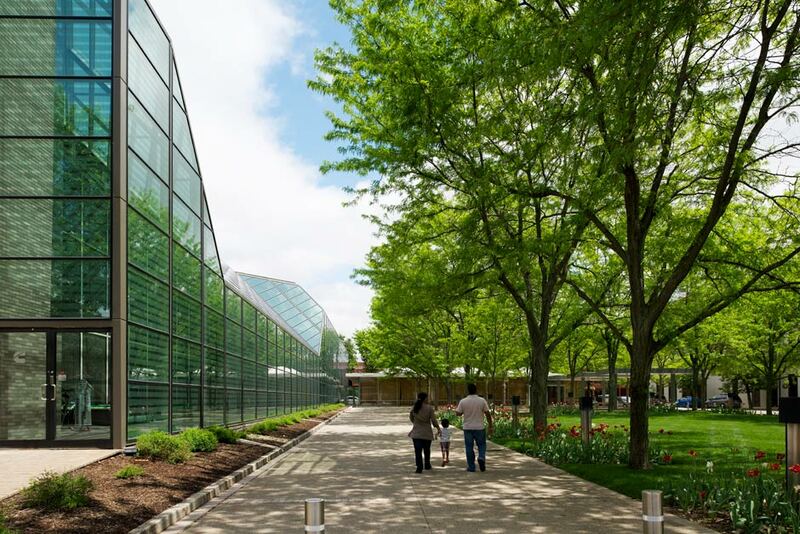 A modern glass annex sits on the northern edge of the lawn, designed by Kevin Roche John Dinkeloo and Associates and added in 1973.The site was designated a National Historic Landmark in 2000. 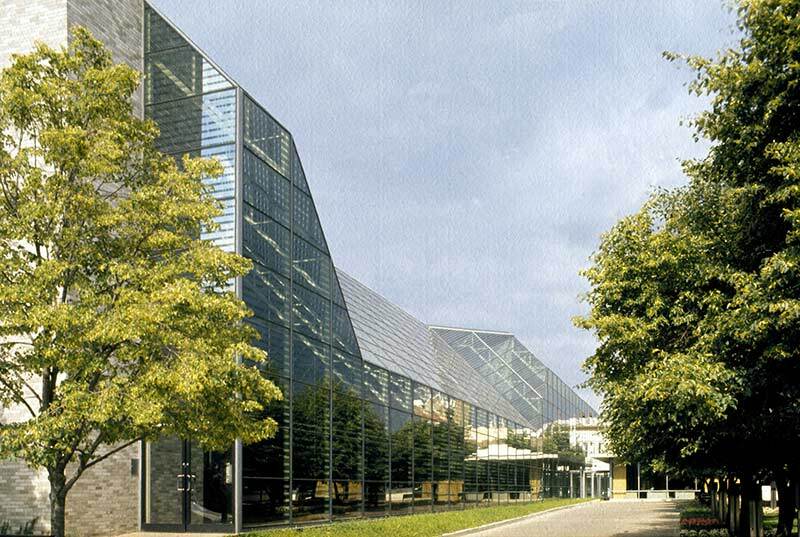 The landscape of the bank has sympathetically changed since its original design. 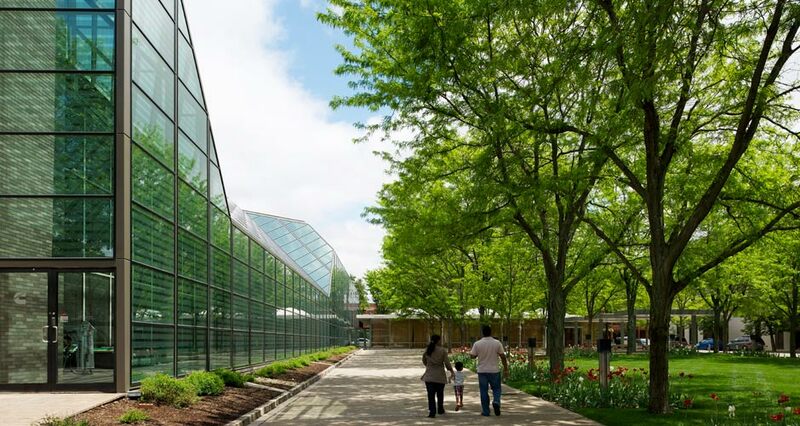 The most significant change has been the in-kind replacement of the littleleaf lindens with honey locusts, whose small leaves and open form diverge from the look and feel that the lindens would have imparted on the space. However, honey locusts were in keeping with Kiley’s typical plant palette, and as one of his favorite species they often appear in his designs. 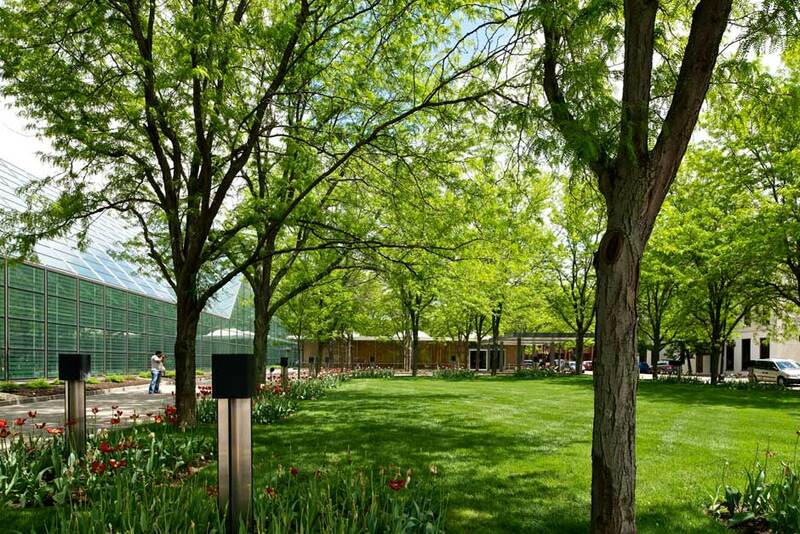 The consistent maintenance of the landscape can be seen in the site’s well-tended lawn and understory plantings - a testament to both the subsequent owners’ appreciation of the landscape (Cummins is the third owner since Kiley’s design was implemented) and the city’s thoughtful stewardship of its remarkable Modernist design heritage. Ladwig, Boris. “Old space, new face: Cummins adapts city landmark for different use.” The Republic, http://www.therepublic.com/view/local_story/Old-space-New-face_1356668397. Columbus Indiana. 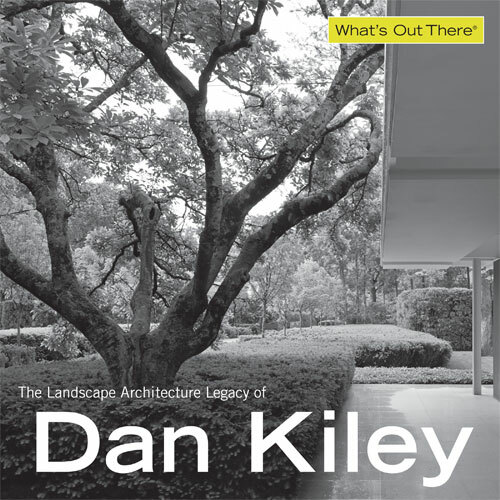 “Architecture and Art: Landscape Architect Dan Kiley,” http://www.columbus.in.us/static/index.cfm?contentID=204. Thayer, Laura, Louis Joyner, and Malcolm Cairns. “National Historic Landmark Nomination: Irwin Union Bank and Trust,” http://www.nps.gov/nhl/designations/samples/in/irwinunion.pdf. Modern Capital. 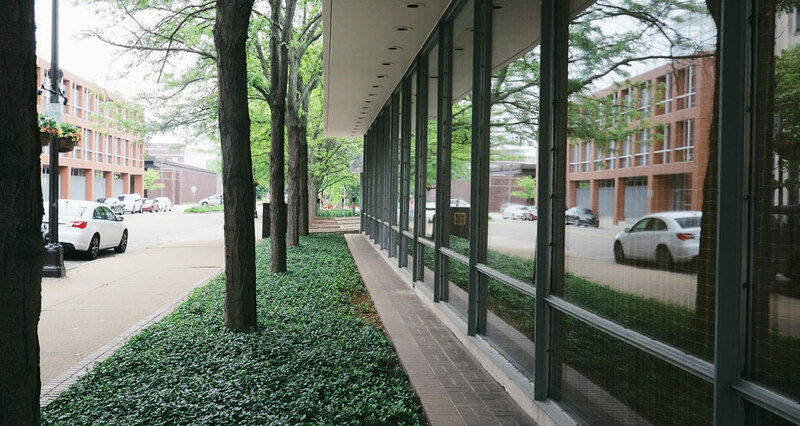 “Modern Columbus: Saarinen’s Irwin Union Bank and Trust,” http://moderncapitaldc.com/2010/06/22/modern-columbus-saarinens-mid-centurymodern-irwin-union-bank-and-trust/. “Landscape Design: Works of Dan Kiley.” Process: Architecture 33. (Tokyo: Japan, Process Architecture Publishing Co., 1982), 128-131. The Cultural Landscape Foundation. “What’s Out There: Cummins Inc. Irwin Office Building,” http://tclf.org/landscapes/cummins-inc-irwin-office-building. Dan’s diagrams were always right. He came at every problem from an oblique and unique view. We at his office were always amazed at his foresight and imagination. Dividing his time between New York City and Columbus, OH, Carbone focuses his lens on the forms, rhythms, and perspectives of urban and rural landscapes. After working for the American Institute of Architects in Columbus, he established his own photography studio in 2008. 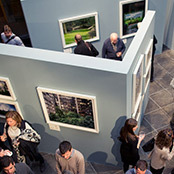 He has won numerous awards for his photographic work, on projects both in the U.S. and abroad.